The Mutually Assured Destruction Of Omaha 24 Hours of LeMons race is over. The cars are on the trailers, heading home, and I'm at the Omaha airport doing the same. 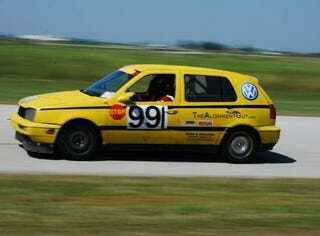 Finally, a Volkswagen has taken an overall LeMons win! The '95 Golf of Team Short bus was driven well, avoided the Penalty Box, and— aside from a leaky transmission that wouldn't hold oil for all of Sunday— didn't break. The second-place car (a Supra) spent the last few hours stuck on the same lap as the Short Bus but couldn't close the gap. Congratulations, Volkswagen and Team Short Bus!